What can I say except this bride had exquisite taste! The moment I walked in and saw her outfit I was in absolute awe. The embroidery on the top was so delicate, and I loved the contrast with the deep red brocade skirt, yet still light enough to wear comfortably. Truly a stunning piece by Elan Couture. The day started with Ushna getting ready at home with the very calm and talented makeup artist Azbah Ali. Ushna chose a sophisticated red for her lips, with intricate ruby stoned jewellery to compliment her regal look. 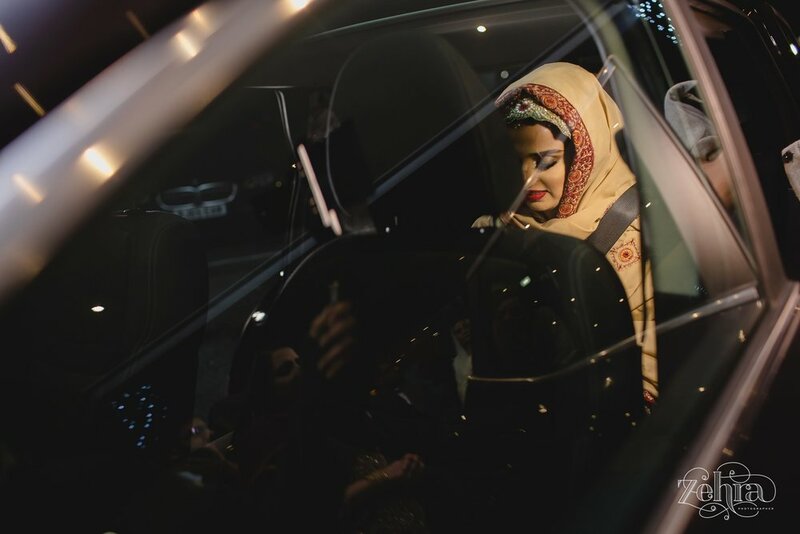 Having shot at the Motorcycle Museum the week before for Hira and Hashim, it was lovely to see the venue transformed completely into a room filled with red roses and soft creams. As Ushna walked into the room, there were a lot of gasps and smiles of delight, as she walked down the aisle accompanied by her father. It was clear she was the apple of his eye, as he recited an emotional poem he had written in Urdu in her honour. Soon after cutting the extremely tall and beautiful cake, the couple sat down to take part in the traditional dudh pilai (milk) ceremony, where the groom is served milk by the bride's sisters and cousins, in exchange for money (as a celebration of their marriage). 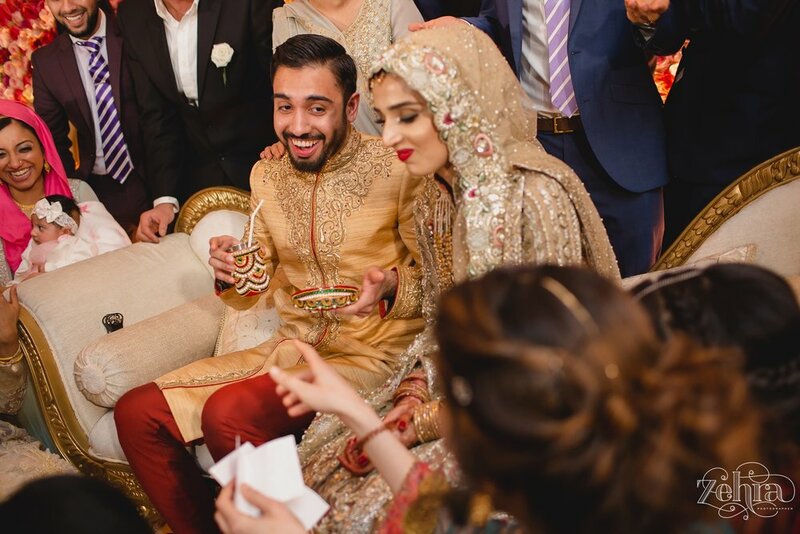 Omar managed to negotiate a price with the girls and dished out some notes, which took a while for the girls to realise they were fake, and completely blank on the back, so the girls stole his shoes (completely unplanned), another tradition in pakistani weddings. 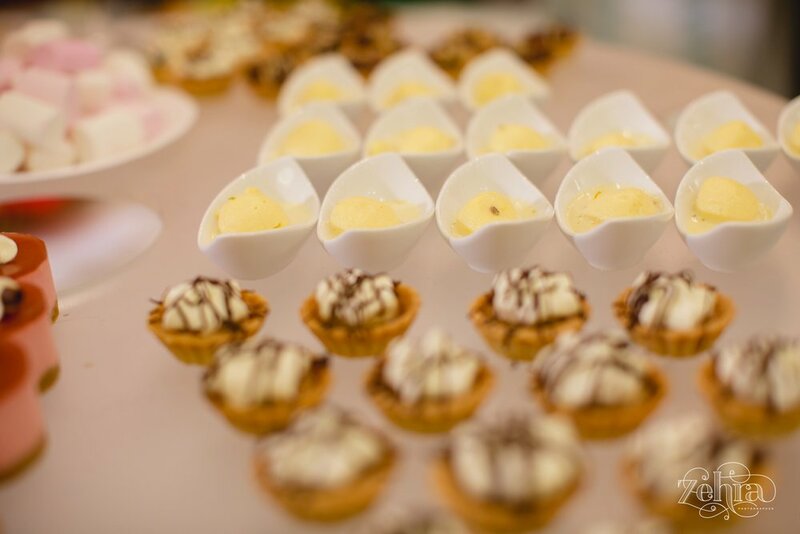 The food, as always, was mouthwatering, with a grand dessert buffet serviced by Sapna Caterers. Goodbyes are always difficult, but with both grandmothers and many guests flying in from abroad honouring the day with their presence, emotions were a little high. All my love to this sweet couple, who were an absolute pleasure to photograph.